Twenty five-hydroxy-vitamin D (25OHD) levels are accepted as an indicator for vitamin D status and their measurement is still a challenge. The aim of the present study was to develop a robust and easy to use HPLC-method for simultaneous analysis of 25OHD2 and 25OHD3 in human plasma and to assess its analytical performance, Protein precipitation followed by liquid-liquid extraction with n-hexane was used for separation from the matrix substances. A HPLC-system with UV detector (Thermo Scientific Spectra System, USA) was used. HPLC-UV analysis was performed on a Synergy hydro-RP column 4,6x250 mm, 4.0 μm particle size with mobile phase consisting of methanol/acetonitrile/water (70/25/5) under isocratic elution at a flow rate of 1.2 mL/min and UV-detection at 265 nm. Our HPLC-method was compared with a validated ID-LC-MS/MS method and with a commercial immunochemical method. Linear regression was used for data analysis. 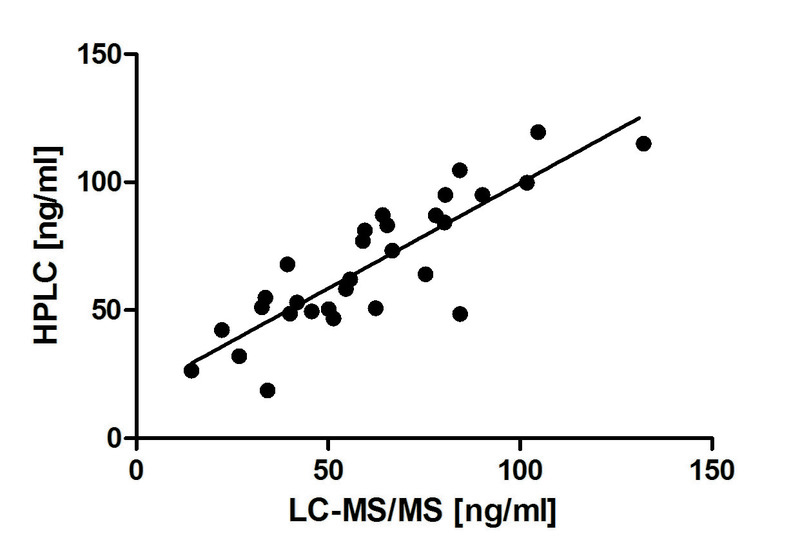 Linearity of the HPLC-assay was between 5-160 ng/ml for each analyte (r2 = 0.99) with lower limit of detection 4 nmol/L, and limit of quantification 10 nmol/L. Intra-assay precision was determined by extracting and quantifying 10 replicates of 4 QC levels (RSD ≤ 9%). Inter-assay precision was determined over 21 consecutive days analyzing 10 replicates of all QC samples (RSD<10%). All results were within 14.2% deviation of the 25OHD LC-MS/MS method mean. Method comparison demonstrated good agreement between HPLC and LC-MS/MS (r = 0.85) and disparity with the commercial immunoassay (r = 0.48). This assay demonstrates excellent linearity, acceptable accuracy and precision, a good agreement with a validated ID-LC-MS/MS method. The simple sample preparation and ease of determination make it useful for the routine clinical laboratory. After discovering the vitamin D receptor protein in tissues not related to calcium homeostasis, numerous pleiotropic effects of vitamin D were established. Vitamin D deficiency is connected with various clinical disorders beside bone diseases [1,2]. As a consequence, the evaluation of vitamin D status is of great importance for making decision for clinical management of vitamin D deficiencies. It is widely accepted that the circulating form of vitamin D, 25-hydroxyvitamin D (25OHD), is the best indicator for assessment of individual's vitamin D status [3,4]. In the last ten years there is an exponential increase in blood testing for 25OHD. A variety of methods, based on two main principles – indirect immunochemical and direct chromatographic are nowadays used for assessment of vitamin D status. The immunochemical methods are mostly used for routine testing due to their simplicity and expediency, while the chromatographic assays are more accurate and reliable . The main limitation of immunochemical methods is the cross reactivity of the antibodies used in the assay. Another restriction is related to their inability to discriminate the D2 and D3 forms of the 25OH metabolite . The chromatographic methods are too sophisticated and require high-qualified laboratory staff. On the other hand they demonstrate excellent analytical performance and selectivity. Recently one of the chromatographic methods, the LC-MS/MS method, is proposed as a reference for measuring 25OHD in blood . The aim of the present study is to develop a robust and easy to use in-house HPLC-method for simultaneous analysis of 25OHD2 and 25OHD3 in human serum and to assess its analytical performance. The reagents and standards used were HPLC grade. Absolute ethanol, methanol, ultrapure water, hexane and acetonitrile were supplied by Sigma Aldrich (St. Louis, MO, USA). 1-alpha cholecalciferol, used as internal standard, cholecalciferol (vitamin D3) and ergocalciferol (vitamin D2) were supplied from Sigma Aldrich, USA. Stock standard solutions of vitamin D3 (2 mg/ml), vitamin D2 (2 mg/ml), and internal standard (2 mg/ml) were prepared in absolute ethanol and stored at −20oC. From these individual standard solutions working standards were prepared by appropriate dilution with methanol. Serum calibrators and controls (bi-level I +II) for 25OHD3 and 25OHD2 were purchased from Chromsystems Instruments & Chemicals GmbH, Germany. The commercial lyophilized serum controls and calibrators were reconstituted in water according to manufacturer's instruction and aliquoted. The aliquots were stored at −20oC. For evaluation of analytical performance and for comparison studies 30 serum samples from the Clinics of Urology and 17 serum samples from the Pediatric ward at the University hospital were used. An informed consent was obtained by the participants. Vacuettes with serum clot activator (Greiner Bio One International GmbH) were used for collection the blood samples. The blood was centrifuged at 3000 rpm for 10 min and the blood serum was immediately separated and stored at −20oC until analysis. In brief the sample preparation procedure includes: to 0.5 ml serum (calibrator, control) was added 1 ml absolute ethanol for protein precipitation. After mixing for 1 min the sample was centrifuged at 5500 rpm for 10 min. The clear supernatant was separated and extracted twice with 3 ml hexane. The combined extract was evaporated under gentle steam of nitrogen. The dry residue was dissolved in 0.2 ml methanol and subjected to HPLC analysis. An HPLC system (Spectra System, Thermo Scientific, USA) equipped with UV detector (UV 2000) was used for chromatographic analysis. The separation of the analytes was performed on RP C18 analytical column Synergy hydro-RP 4,6x250 mm, 4.0 μm (Phenomenex Inc., USA). The mobile phase consisted of 70% acetonitrile, 25% methanol and 5% water and used in isocratic elution mode with a flow rate of 1.2 ml/min. Injections were done using a Rheodynetype 7125 six-port valve equipped with 20 ul loop. The detection was carried out at 265 nm. Instrument control, data collection and quantitation were performed by the help of ChromQuest 4.2.34 software. For method comparison studies an ID LC-MS/MS and immunochemiluminescent assay using the platform of DiaSorin Liaison were performed. Determination of 25OHD was performed by a validated LC-MS/MS method. Briefly, 100 μL of human plasma or serum were precipitated with 150 μL acetonitrile containing the internal standard, d3-25-hydroxyvitamin D3 (d325D3).Then 25OHD3, 25OHD2, and d325D3 were extracted with 1.0 ml of hexane. Chromatographic separation was performed on a C18 analytical column with isocratic elution at a flow rate of 0.1 mL/min, utilizing a mobile phase consisting of 85% aqueous methanol/ammonium acetate/formic acid buffer. Positive-ion electrospray ionization at 25 KV and selected reaction monitoring were used to follow the predominant transitions: collision energy (CE) =10 at m/z 401→383 for 25OHD3, CE=10 at m/z 413→395 for 25OHD2, and 404→386 for d325D3. Method was validated according to FDA guidance requirements. Calibration curves were constructed using 6 point industrially certified human serum calibration standards. Quality assurance utilized in-house prepared and commercial quality control samples, and participation in external proficiency testing program (DEQAS, UK) with uninterrupted certification. Method selectivity was assessed with 6 different individual sources of human plasma, and confirmed with matrix effect (ME) averaging 91-93% for 25OHD3, 82-92% for 25OHD2, 84-89% for d325D3, and relative ME of 105-108% for 25OHD3, and of 97-104% for 25OHD2. Accuracy and precision (within-run and between-runs) were all within 7.5%. Extraction recoveries averaged 57-64% for 25OHD3, 69-73% for 25OHD2, 55-56% for d325D3; linearity range for both 25OHD3 and 25OHD2 was 1.2-120.0 ng/ml, R2>0.99. Freeze-thaw stability was determined for three cycles each lasting 24 h, post-preparative stability was documented for 96 h at 10oC, short-term stability at ambient temperature was proven for 24 h in the dark and for 2 h at daylight; stock solution stability and long term stability in plasma – for 5 days at 4-8oC, and for 99 days at -20oC. With run time of less than 10 min, a throughput of over 100 samples per 24 h was achieved, with instrument running unattended overnight. The levels of 25OHD in patients' samples were measured using commercial controls and calibrators according to the manufacturer's instructions . A typical chromatogram of a calibrator and patient sample illustrating the separation of 25OHD3, 25OHD2 and internal standard 1alpha-25OHD3 from the other serum components are given in Figures 1 and 2. The retention times were 9.14 min for 25OHD3, 10.08 min for 25OHD2 and 16.03 min for the internal standard. The total analysis time was 22 min typical for conventional HPLC assay. Figure 1. HPLC chromatogram of a commercial serum calibrator. 25OHD3 = 37 ng/ml; 25OHD2 = 28.2 ng/ml; ISTD = 100 ng/ml Peak 1 – 25OHD3, retention time = 9.14 min. ; peak 2 – 25OHD2, retention time = 10.8 min. ; ISTD – internal standard 1-alpha-OHD3, retention time = 16.03 min. Figure 2. HPLC chromatogram of a patient sample. 25OHD3 = 14.30 ng/ml; ISTD = 100 ng/ml Peak 1 – 25OHD3, retention time = 9.10 min. ; ISTD – internal standard 1-alpha-OHD3, retention time = 15.71 min. The analytical performance was evaluated by the precision data, limit of quantitation (LOQ), limit of detection (LOD), linearity and average recovery for both 25OHD3 and 25OHD2 using commercial control serums. The analytical accuracy was estimated for two target concentrations: 37 ng/ml and 51 ng/ml. The percent relative errors were 1.08% and 1.27%, respectively. The precision data were summarized in Table 1. The LOQ for both analytes was 10 ng/ml and the LOD – 4 ng/ml. The assay was linear form 5-160 ng/ml for 25OHD3 with the following regression equation y = 0,04318*X + 0,08295 (r2 = 0.9996). For 25OHD2 the linear range was from 5-160 ng/ml and regression line equation was y = 0,04464*X + 0,1430 (r2 = 0.9935). In each case, x represents the concentration added to a serum sample and y the analytical result. The analytical recoveries based on standard addition to patient samples were calculated for the concentration range 10-100 ng/ml in three replicates for each concentration. The analytical recoveries varied form 82-110% for 25OHD3 and form 87-101% for 25OHD2. Table 1. Precision characteristics of the proposed HPLC-UV method. RSD, relative standard deviation; within run precision was calculated from 10 replicates for each concentration level; within run precision was calculated for 21 consecutive days for each concentration level. In order to ensure the analytical reliability of our method we participated in the Vitamin D External Quality Assessment Scheme (DEQAS). In the concentration range 19 ng/ml to 40 ng/ml our results were within average value ±1SD. The target value of the lowest tested concentration was 11,7 ng/ml, close to the LOQ of our assay. In that case the obtained result was within the range average value +2SD. Method comparison studies were done between our in house assay, ID LC-MS/MS , a candidate reference method, and the routine immunochemiluminiscent assay of DiaSorin Liaison (Figure 3 and 4). Acceptable agreement was obtained between the two chromatographic methods (n = 30; r2 = 0.85). Comparing the data obtained by our method with those of DiaSorin Liaison we found lower degree of consistency (n=17; r2 = 0.48). Figure 3. Comparison of 25OHD3 values obtained by the proposed HPLC-UV method and ID LC-MS/MS method. Figure 4. Comparison of 25OHD3 values obtained by the proposed HPLC-UV method and DiaSorin Liaison 25OH vitamin D Total assay. In the last two decades high rates of vitamin D deficiency have been reported not only in adults but also in children worldwide. It's been estimated that more than half of all children and adults in the U. S. and Europe are at risk . Therefore the estimation of vitamin D status attracted the attention of many researchers and clinicians. The best determinant for vitamin D status is accepted the circulating form of vitamin D 25OHD . Two forms of 25OHD can be detected in the circulation, 25OHD3, mainly formed in the skin after sun exposure, and 25OHD2 derived from the diet. Administration of vitamin D analogs and supplements for treatment of vitamin D deficiency requires a follow-up assessment of vitamin D status. Therefore a simple, precise and inter-laboratory consistent method for measuring the 25OHD levels is needed. Being a lipophilic compound 25OHD is transported by the blood as a complex with vitamin D binding protein (DBP). Competitive binding to DBP derived from rat serum was the basis for the first immunoassay for measurement of 25OHD levels. Recently a numerous competitive immunochemical assays were introduced differing in binding agent and method of detection [10,11]. A common disadvantage of these methods is their limited selectivity towards 25OHD3, 25OHD2 and other polar vitamin D metabolites . Nowadays the immunochemical assays are widely used in the routine laboratory practice for their convenience, speed, turnaround and cost . Most of the disadvantages of immunochemical methods were overcame by the direct chromatographic methods. These assays quantitatively and selectively measure both 25OHD2 and 25OHD3 [6,14]. In the last few years the interest in testing 25OHD levels was exponentially increased in Bulgaria. For that reason several clinical laboratories introduced routine immunochemical assays. In Bulgaria a chromatographic method using liquid chromatography coupled to tandem mass spectrometry was developed for first time in 2012 at the National Reference Laboratory for Drug Monitoring. Since the LC-MS/MS method is quite sophisticated and requires skilled personnel and higher cost equipment, another more conventional chromatographic method was needed for reliable determination of vitamin D status. In our in-house method a simple sample preparation procedure based on protein precipitation followed by liquid-liquid extraction ensures effective release of 25OHD from the binding protein and obtaining a "visibly" clean extract. The smallest sample size for the method was 0.5 mL, the LLQ was 10 ng/mL for both 25OHD3 and 25OHD2. The linearity range (5-160 ng/mL) covers the clinically significant interval for detection of vitamin D deficiency, insufficiency and sufficiency. The within-run precision varied between (12.7 ng/ml -100 ng/ml) RSD for 25OHD3 and (11.4 ng/ml - 100 ng/ml) RSD for 25OHD2. The between-run precision was between (100 ng/ml - 12,7 ng/ml) RSD for 25OHD3 and (100 ng/ml - 11.4 ng/ml) RSD for 25OHD2. The analytical performance of our method in terms of LOD, LOQ, linearity, precision was in agreement with the performance of other published HPLC procedures . Recently, the National Institute of Standards and Technology (NIST) developed an isotope-dilution (ID) method coupled with LC-MS/MS for the determination of serum 25OHD3 and 25OHD2–a candidate as reference method for 25OHD measurement. The use of stable-isotope-labeled internal standard identical to the analyte guarantees highest analytical accuracy of ID LC-MS/MS method and is a basis for the selection of this method as reference [5,15,16]. We have compared our in-house HPLC method with an ID LC-MS/MS method developed by the National Reference Laboratory for Drug monitoring in Bulgaria. The comparison study showed very close values (r2 = 0.85) for 30 patients' samples containing 25OHD in the range 7-48 ng/ml. A very good correlation between HPLC and ID LC-MS/MS assay (r2 = 0.99) was reported also by others . The immunochemical methods are the most routinely used for analysis of 25OHD in clinical laboratory practice due to their simplicity, speed and short turnaround time. The latest modified version of DiaSorin for testing 25OHD Liaison Total assay was accepted as one of the most reliable amongst immunochemical assays . The comparison of results obtained by our HPLC method and DiaSorin Liaison Total assay showed poor correlation (r2 = 0.48). The DiaSorin Liaison Total method overestimated total 25OHD concentrations by an average of 7%, having in mind that in our samples the 25OHD3 was the only form in serum. This worse agreement may be due to cross-reactivity of the antibodies typical for immunoassays, to random errors related to antibody binding or matrix effects, whereas these limitations are not an issue in the direct chromatographic methods due to their high selectivity. 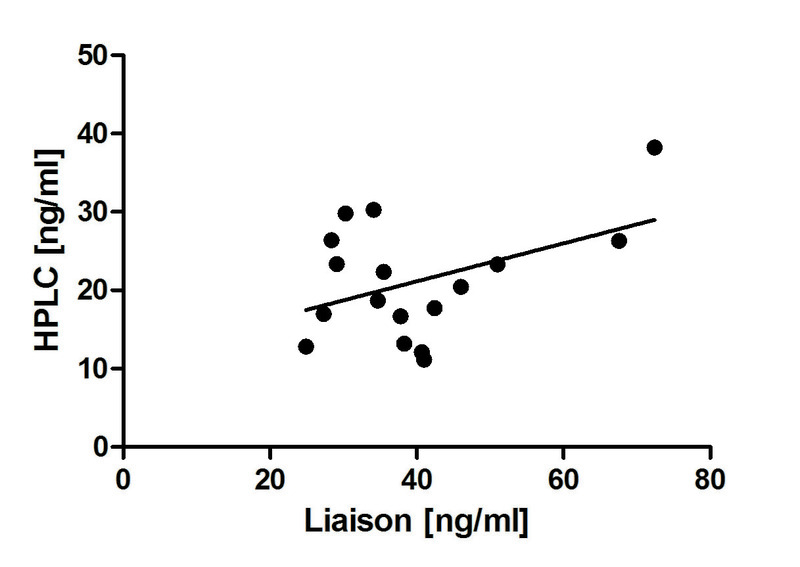 Poor correlation between HPLC and Liaison assay (r = 0.735; n = 203) was reported also by others [17,18]. In summary our HPLC method enables reliable quantification of both 25OHD3 and 25OHD2. The relatively short analysis time make it useful for routine clinical laboratory practice. The HPLC procedures would be the preferred techniques for measuring these two metabolites due to its high selectivity and better analytical performance. The use of commercial serum calibrators and controls diminishes the variability of the results obtained with different chromatographic technics and allows better traceability. The study was supported by the Science Fund at the medical University of Varna, Bulgaria. IOM (Institute of Medicine). Dietary reference intakes for calcium and vitamin D. Washington, DC: The National Academies Press; 2011. Wallace A, Gibson S, de la HuntyA, Lamberg-Allardt C, Ashwell M (2010) Measurement of 25-hydroxyvitamin D in the clinical laboratory: current procedures, performance characteristics and limitations. Steroids 75: 477-88. DiaSorin LIAISON. 25 OH Vitamin D TOTAL Assay (brochure). Guo T, Taylor R, Singh R, Soldin S. Simultaneous determination of 12 steroids by isotope dilution liquid chromatography-photospray ionization tandem mass spectrometry. Clin Chim Acta 2006; 372:76-82. ©2014 Galunska BT. This is an open-access article distributed under the terms of the Creative Commons Attribution License, which permits unrestricted use, distribution, and reproduction in any medium, provided the original author and source are credited.